Can VLC play M4V files? Yes, VLC plays DRM-free M4V videos perfectly without additional tools or M4V codec packs. The open source media player works with many types of video and audio formats, including M4V, 3GP, AVI, WMV, MP4, QuickTime file format, MPEG-2 and more. Here's a full guide on how to play M4V Videos in VLC. In addition, VLC can convert M4V to MP4, and we also cover how to do that in this guide. Some M4V video files might fail to play in VLC because of DRM copy protection, unsupported codecs or others. If that happens, try our tips to fix M4V videos not playing in VLC. Free download the M4V converter, editor & player for Mac and Windows PC, MacX Video Converter Pro, to solve many kinds of VLC not playing M4V issues caused by damaged files or unsupported codec etc. It can convert M4V to VLC playable formats, repair corrupted M4V files and more. It's child's play to play M4V in VLC. You can open the M4V player on Mac or on your Windows PC and select an M4V video file to play, or simply drag and drop the video to VLC interface, or click the source video and select to open with VLC. If you prefer VLC, you can set VLC as default video player. Note that VLC can play multiple M4V videos sequentially. Here's how to do that. Currently, VLC doesn't support to do so on Mac. Step 1: Open VLC media player, click Tools > Preferences or press Ctrl + P on Windows PC. Step 2: Under Interface tab, find Playlist and Instances. Step 3: Make sure the "Allow only one instance" option is unchecked, and untick "Use only one instance when started from file manager". Step 4: Click Save to save the settings. Now you can open more than one VLC media player at a time and play as many as M4V video files with VLC. Mac users who want to play multiple M4V videos in VLC on Mac can resort to VLC droplet/app. If the M4V videos are 4K UHD, get to know how to play 4K with VLC. Know more M4V player apps for Android to play M4V videos on Android phones and tablets. VLC won't play M4V videos that are DRM protected. VLC shows a black screen when playing DRM M4V videos purchased from iTunes. You have to remove the DRM from encrypted M4V videos you'd like to play in VLC. You can use solid DRM removal software like MacX MediaTrans. It can remove DRM from iTunes and convert M4V to DRM-free MP4 format. Then you can play M4V in VLC without issues. VLC has some basic video conversion function. It's quite easy to convert M4V to MP4 with VLC media player. Use steps below. Step 1: Click Media > Convert/Save, and you'll see an Open Media window. Step 2: Click Add… button and select source M4V files. Step 3: Click Convert / Save button at the bottom to enter Convert window. Step 4: Find Profile category. Click its drop-down icon and select Video - H.264 + MP3 (MP4) as output from the list. Step 5: Click Browse button to select a destination folder to store converted files, and click Start to processing M4V to MP4 conversion in VLC. 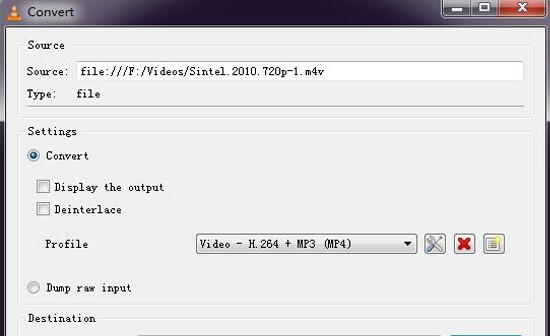 Related guides: convert MKV to MP4 with VLC, M4V to MP4 in Handbrake. Q: Not playing .m4v files in VLC? I'm using the latest version of VLC player, it won't play .m4v files. The file appears to start playing, but there's no audio or video. What's the problem? 1. You are running an old version of VLC player. 2. Improper video playing settings in the media player. 3. The M4V video you'd like to play in VLC is copy protected. DRM encrypted M4V videos won't play in VLC with a black screen window showing only the playback controls. 4. The M4V video you can't play in VLC is encoded with codecs unsupported by the media player. 5. The video is damaged. VLC may fail to repair corrupted M4V videos before playing. VLC related: VLC won't play MKV, VLC audio sync problems, VLC subtitles delay with video. Try the following steps to fix M4V videos not playing problem in VLC. After each step, play M4V in VLC again to check if the problem is resolved or not. 1. Update to the latest version of VLC media player. Click Help > Check for Updates… in VLC to check if an update is available. 2. Read VLC official guide or forums and see if you are doing the video playing settings wrongly. 3. M4V videos purchased from iTunes are encrypted by Apple's FairPlay DRM. You need to remove DRM from iTunes with cutting-edge DRM removal software. MacX MediaTrans mentioned above does the job perfectly. 4. Try other media player to play M4V video files. If the files are damaged, follow to repair MP4 as well as M4V video. 5. Use a video converter for Mac/PC to convert M4V videos to VLC supported codecs. M4V videos not playing in VLC issue caused by codec compatibility should be fixed in this way. Free download the best video converter for Mac/Windows to convert M4V to VLC, as well as MKV to MP4, AVI to MP4, AVCHD to iPhone, FLV to iPhone, YouTube to MP4/MP3, etc. Also a good video editor and compressor to repair M4V, split/trim/crop/rotate video, add subtitles, adjust video resolution, frame rate, bitrate, aspect ratio and other video parameters, etc.